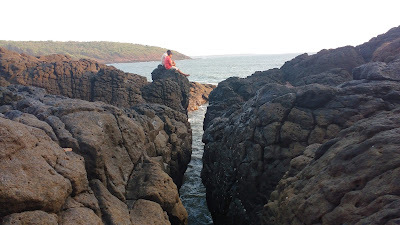 The Konkan region offers some impeccable and quick getaways from Mumbai and Pune. Most of the destinations within a 4-5 hour driving distance are getting increasingly crowded and seldom offer the tranquil solitude that one expects from a weekend. But then if you can travel overnight, then some quirky gems await you. 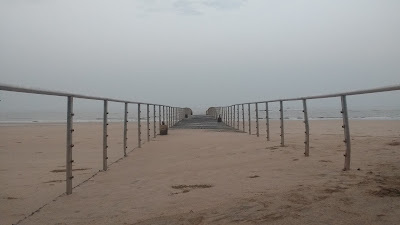 Take the Guhagar section for instance - you have the empty beaches, weird coastlines, histoic temples, forts, a light house, a jetty, a power plant and crocodiles! Add to that a dash of the laid back lifestyle and you have an idyllic break that will bring you back here again. This post is aimed to be a starting point on spending a quick weekend around Guhagar for a solo backpacker. The effective area is the one that lies between the creeks of Dabhol in the north and Jaigad in the south. Guhagar - for a weekender - is best approached by an overnight bus. Direct services are available from the MSRTC from Mumbai and Pune. 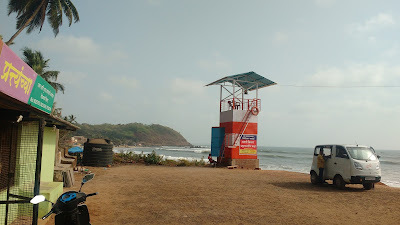 Private operators also run their buses which terminate at minor villages along the coast. 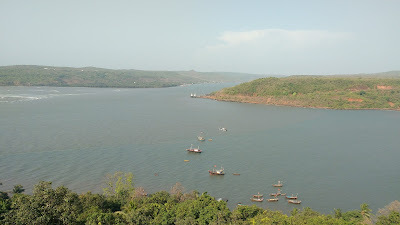 The route follows the Mumbai-Goa highway up to Chiplun city and then forks off to the west for Guhagar. Another alternative is the Konkan Railway. Chiplun is the convenient rail head and is in itself a major station on the line. 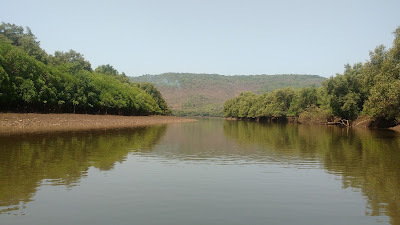 Guhagar is about an hour away from Chiplun. Whatever your mode of transport, aim to reach Guhagar by dawn so that you can spend the best time here. From Guhagar ST buses and 6-seater rickshaws are available for most of the destinations from 8am to 6pm. Guhagar is a small coastal temple town gifted with a long stretch of beautiful white sand beach. 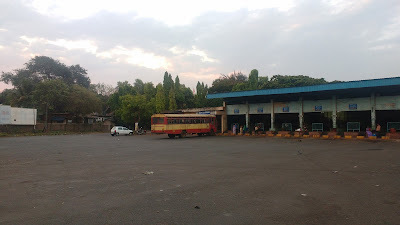 The bus stand is the effective centre of the town, just next to the 'T' junction of the east-west road from Chiplun and the north-south road parallel to the coast. The main beach is a half-minutes walk from this junction. The beach is the best place to sit down and unwind on the morning after the long journey here. 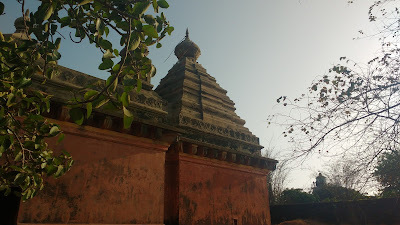 Another place where you can unwind - albeit in a different manner - is the Vyadeshwar (Shiva) Temple. The spacious temple with its gentle rhythms and music is perfectly in sync with the setting - one can say it almost defines it! 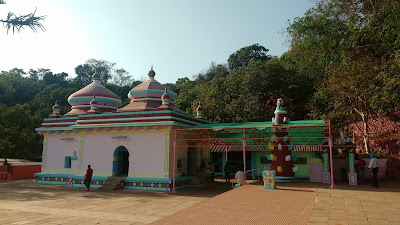 The temple is significant too, revered by many families as their kuldaivat. 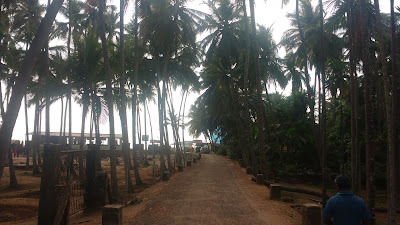 Walk for a minute or two on the roads leading north and south - varcha pat and khalcha pat - and you'll find yourself amid expansive wadis of coconut, betelnut and mango trees. 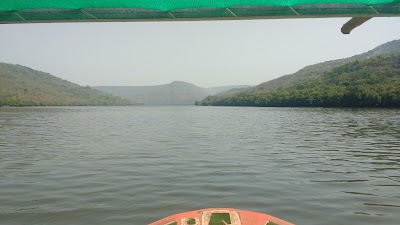 This is the quintessential Konkan. 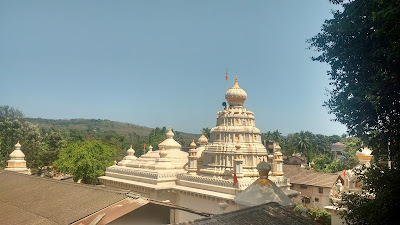 There are a couple of other significant temples here - the Durga temple and the Ufarta Ganpati Temple - both to the northern side. 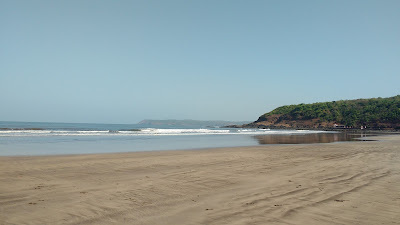 The beach stretches northward and southward until it is interrupted by hills on either side. 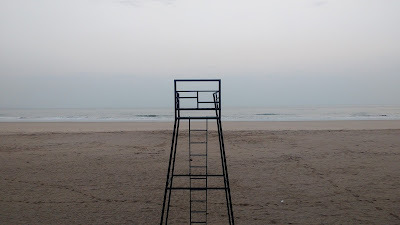 The beach - though beautiful - is notorious for being unsafe and strict precautions must be taken. Hedavi is the best place on this coastline for a quick dip. 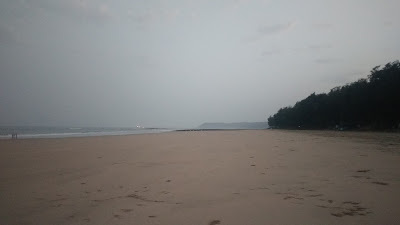 The beach is rather small, but virtually empty. The waves are easy, the slopes are gentle and the sand for most part does not stick. Of course, going into the water necessitates that you have a place to change - Hedavi has a few home-stays where one can stay and this issue is sorted as well. People who don't wish to enter the waters should also visit the beach to see the spectacle of 'Bamanghal'. Bamanghal is a steep and sharp gorge carved in the rocks to the north of the beach by the sea. Time your visit to coincide with the high tides and you can witness the water gushing through the gorge like a huge fire-hose. 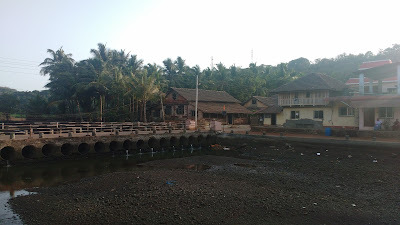 The route to the gorge starts behind the Uma-Maheshwar temple at the north of the beach. 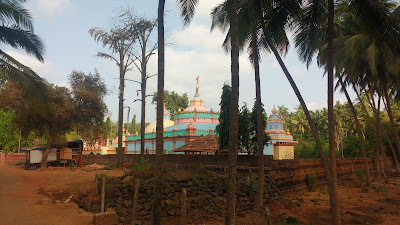 Speaking of temples, the main attraction of Hedavi is also a temple - the Dashbhuja Ganesh mandir. 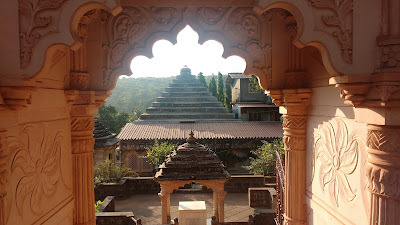 The temple dates back to the times of the Peshwa. 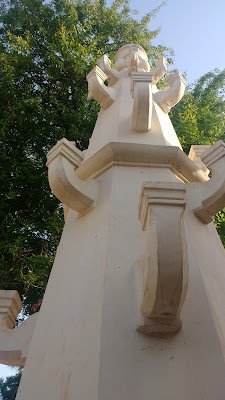 The temple is known for the unique 10-handed (dashbhuja) idol of Lord Ganesha. A math dedicated to Swami Samartha is also quite beautiful. Hedavi is an hour's bus ride from Guhagar on a road which for most part passes through dense mango orchards. Halfway between Guhagar and Hedavi lies the sleepy village of Velneshwar. 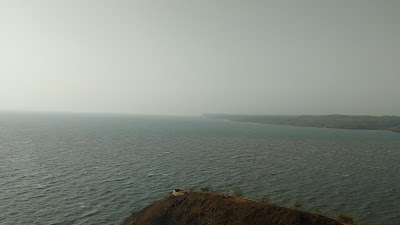 The road from either place descends to Velneshwar from a considerable height and offers an amazing view of the palm-lined coast. 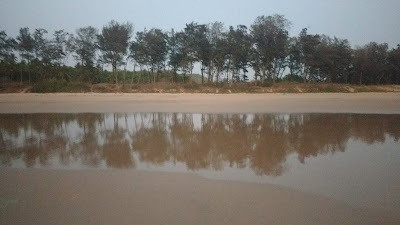 On a good day the view from the road resembles a tir-colour strip - green palms, white sand and the blue sea.The village is famous for the temple of Velneshwar, i.e. Shiva. The temple sees quite a crowd during Mahashivratri. The beach is close at hand, but the slope is steep and the sea tends to become quite violent at times here. Definitely not advised to venture out into the water here. Anjanvel is another sleepy village, but to the north of Guhagar - about 30mins away. The first thing that strikes a visitor here is the sheer number of huge buildings enroute this village. 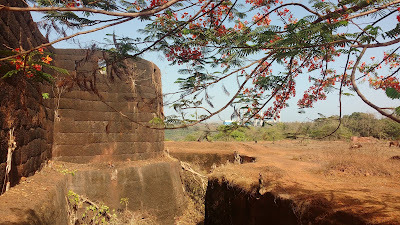 These are the remains of the world famous Enron power plant - or the Ratnagiri gas and Power Limited as it is known now. 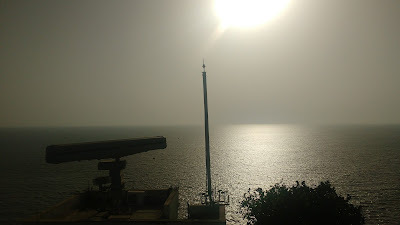 The power plant is usually associated with Dabhol, which lies on the other side of the Dabhol creek (of the Vashishti river). It was probably better known than Anjanvel, so the name stuck. 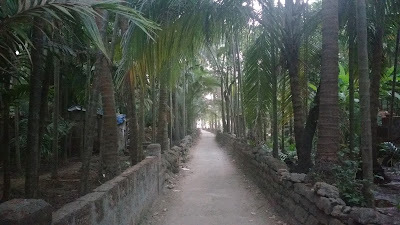 The road to Anjanvel passes next to the premises of this massive plant. 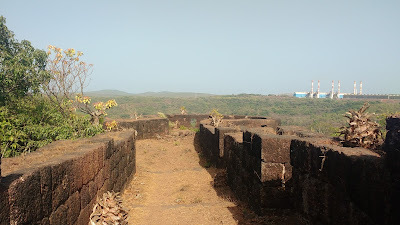 The road to Anjanvel descends sharply from a height to the sea-level when the main village is and then rises again westwards to reach the Gopalgad fort. 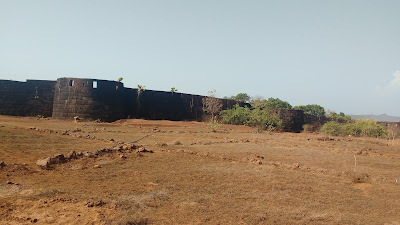 The fort is now private property (how?) but entry is free. 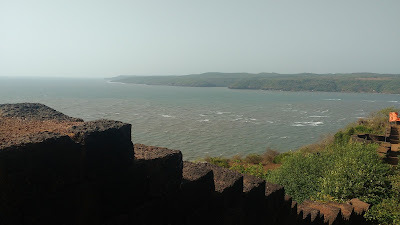 One can take a stroll along the ramparts taking in the view of the sea and the Dabhol Creek. 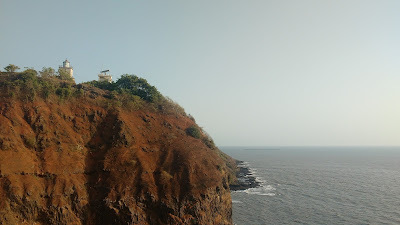 From Gopalgad one can head further west to the Anjanvel light house and Takaleshwar Temple. The lighthouse has visiting hours from 3pm to 5pm and offers a commanding view of the sea and the docks used by the power plant. It gets pretty crowded sometimes. There's another viewpoint close by which again offers a good view of the sea and the lighthouse itself. 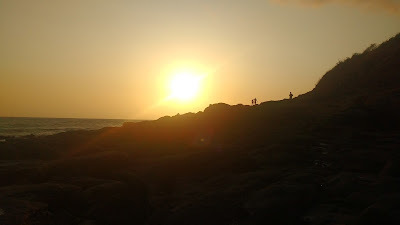 Its a good place to catch the sunset, if one does not have to hurry elsewhere. The creek of the Vashishti river is a thriving ecosystem which houses one of the apex predetors - the Indian salt-water crocodile, a.k.a. the mugger. 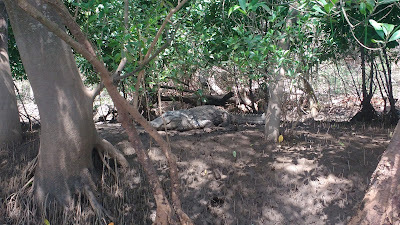 Quite a few of these large beasts populate the area and it is possible to see them up close on a crocodile safari. The safaris are piloted and guided by locals who are quite familiar with the sites and movements of these beasts. Parchuri, located about an hour's bad road from Guhagar is the place to spot these. Safaris can be booked from Guhagar itself. 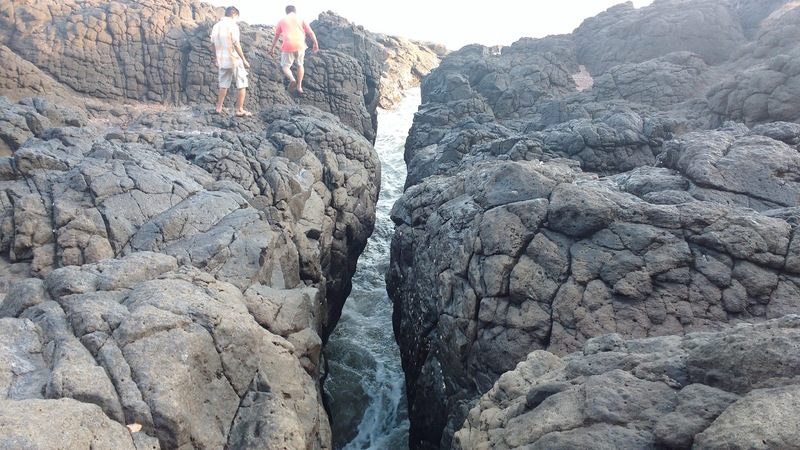 The timings of the safaris vary depending on the high and low tides - low tides are preferred. 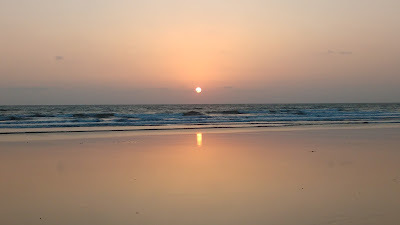 With the weekend about to come to a close, one has to say goodbye to this slice of Konkani paradise. Let the sun set and catch yourself a breather. Gulp down some tender coconut water for good measure. 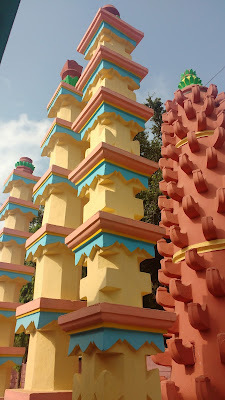 Go to the temple of Vyadeshwar again, about the time it closes. Soak it all in once more. The buses from Guhagar to Mumbai or Pune leave at about 8pm. The trains from Chiplun leave much later. In most cases, you'll find yourself at your work-desk on time the next day. Valuable information, would love to do the crocodile safari and also check out the 'Bamanghal'. Thank you.